The 16 ft. suspension bridge was built by Eddie Merma and Johno Landsman as an addition to Solomon's Treehouse built in 2015. 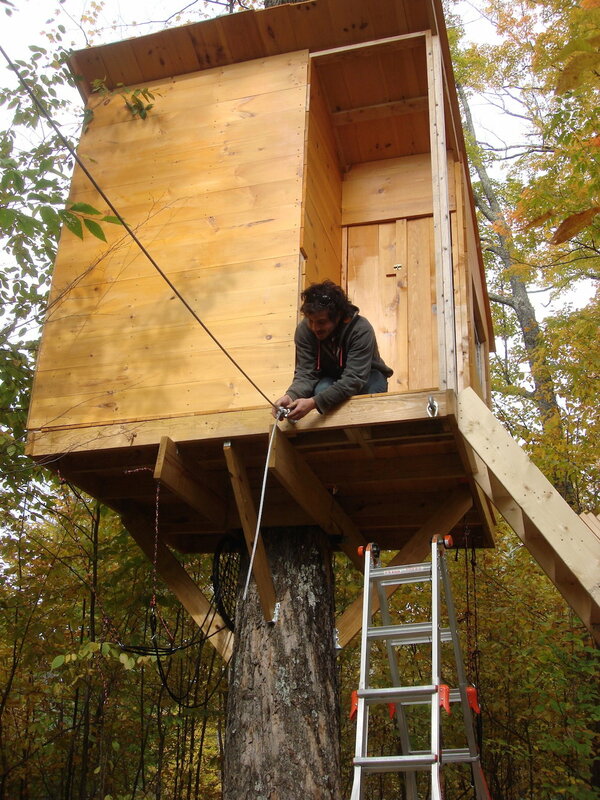 We started by building an 8'x8' platform on a tree 25 ft. across from the treehouse. The first step was inserting load bearing lag bolts into the maple tree. We used a high torque drill and auger bit to make the holes, and a large socket wrench to crank the bolts into the tree. Two parallel 2"x10" boards were then placed on top of the suspension brackets and secured with screws. Once level, the frame for the platform was assembled on top of the secured parallel boards. Angled braces were added to give the platform additional support. 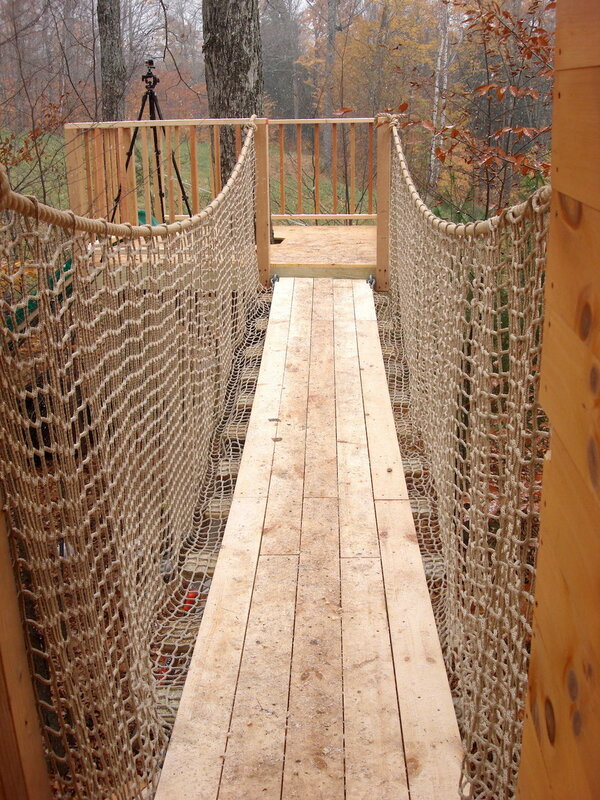 After completing the platform frame we attached the floorboards and built a railing around the perimeter, leaving entry points for the slide and suspension bridge. The 16 ft. slide was assembled and installed on the new 8'x8' platform. 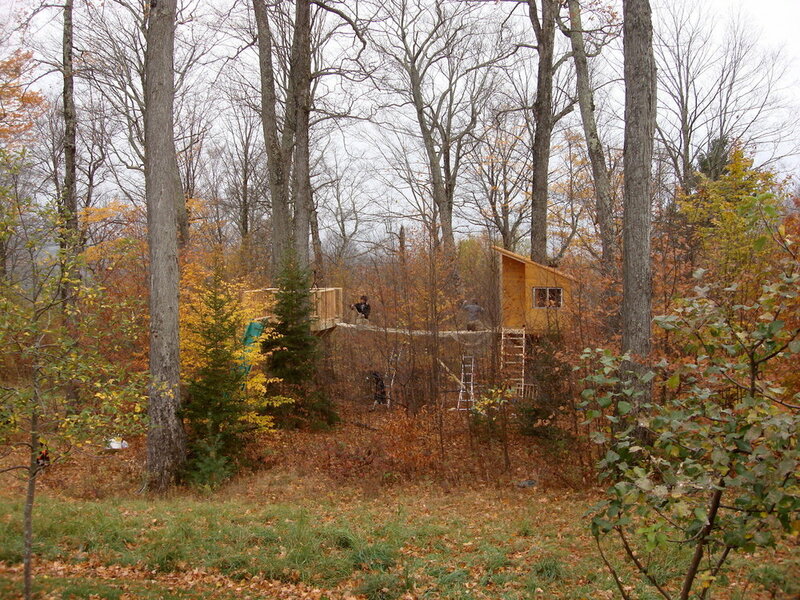 The slide was purchased from Treehouse Supplies, and consists of top and bottom pieces and 5 interlocking middle pieces. Before we could hang the steel cables for the suspension bridge, we installed a guy-wire to a tree behind the 8'x8' platform. With the extra stability, the free standing platform could support the thousand pounds of tension from the bridge. After the installation of the guy-wire we began to reinforce the platform with support blocking for the eyebolts which would receive the steel cables. Once the eyebolts were installed to both platforms, the steel cables were hung, leveled, and secured using fist grip clamps. The assembly of the bridge flooring began by attaching 2"x8"x36" boards to the steel cables. After the boards were secured, the netting was draped over the bridge surface. The next step was to lay the 5/4"x6" decking boards parallel to the steel cables. The boards were screwed through the netting into the 2"x8" perpendicular boards. Our friend Anna came by to help with the netting installation and Solomon taught us how to tie a bowline knot with the top rope handrail.